Theodore Boone is facing his biggest case yet and it's one he can't solve on his own. In desperation, he turns to the one man he can trust, his Uncle Ike. Together, they take some pretty big risks to prove the suspect's innocence. I loved this book. It is the best of the series so far. I really can't tell you a thing about the plot as it will give too much away. This is one book that you just have to jump into and trust that it will capture your imagination and transport you right into this challenging case. 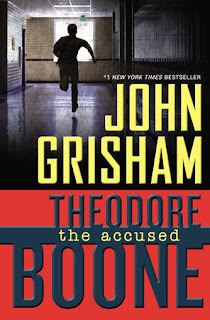 Adult fans of John Grisham will find this a complex legal tale as you'd expect from him, but in a shortened, kid length novel. I found myself eagerly waiting for the next plot development. The bond between Theo and his Uncle Ike deepens. Readers learn a bit more about Ike, but there is still the biggest mystery about him yet to be revealed in future books in this series. The story continues in The Activist.